Most of us know someone who has had a problem with identity theft. It's a big problem in the digital age - but how do fraudsters get hold of your details and how can you protect yourself? Every time you open an account, vote or pay a bill, information is recorded on you - such as your name, your address, your national insurance number, your credit card details, so much so that you probably never even think about just who has access to your personal information any more. It can actually be quite scary to think just how much information is out there for anyone who wants to look. Add to this the increasing popularity of social networking sites, then it’s easy to see how people are becoming easier and easier to track down and identify all the time. But Why Would Someone Want my Personal Details? Opening new utilities accounts and use your details to pay for their electricity, gas and phone bills. How Do They Get Hold of my Information? Thieves will go through your rubbish bins looking for discarded bank statements, utility bills and anything else that might contain pertinent information. 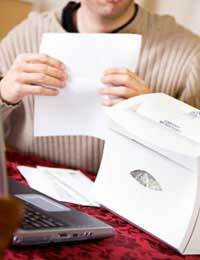 They will intercept a change of address form, or take one from a discarded statement and return it with a new address on, diverting your post to wherever they want so you aren’t aware of any rising bills or new accounts that they open. They may steal your purse or handbag, and get information from your bank cards, receipts and documents such as your passport or driving licence. They may ring you or email you pretending to be from a company that you deal with and get you to answer questions that give them the information that they want. How Will I Know if my Identity has been Stolen? If you're lucky you'll find out pretty quickly. Maybe you'll get a letter thanking you for opening an account that you didn't open, or similar. If you're not so lucky you wont find out until the thieves have taken out credit cards in your name or have even emptied your bank account. You might find yourself turned down for a car or a mortgage due to a bad credit history you didn't know you had, and that’s when alarm bells should start ringing. IF this happens and you suspect that your identity is being used fraudulently, contact the credit reference agencies for a full credit report. You can usually get these online. Look at it carefully and contact immediately any organisations you don’t recognise, or don’t have accounts with. Keep detailed records of who you have spoken to and when, and any correspondence you have had. Report this to any financial institutions involved. If the fraud involves plastic cards, online banking or cheques, then when you report it to the financial institution concerned it becomes their responsibility to deal with the situation and carry out investigations - reporting any fraudulent and/or criminal activity to the police to follow up. Consider signing up to the CIFAS Protective Registration Service which will ensure that extra checks are carried out when your address is brought up in an application. It can make genuine applications a little more difficult but can be well worth it in the long run. If you think your post is being intercepted or has been redirected, let Royal Mail know and they will help you. Keep any financial institutions you deal with up to date with home moves - a large percentage of identity theft happens when people move house and their post is not redirected. Know where your bank cards/cheque books are and cancel them immediately if they are stolen. Make sure no-one can access your personal information on any computers or telephones you use. Keep your passwords safe, change them regularly and don't keep them or PIN numbers with you. Be very careful who you give information to on the telephone or via email. Always verify who you are speaking to and ask for a number that you can call them back on. Genuine callers will understand your concern and be happy to oblige.